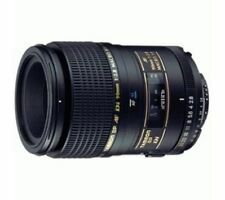 Tamron SPAF 90mm F2.8 Macro 1:1 lens for Canon AF’s. Worked on a Canon 7D giving the equivalent of 150mm 1:1 Macro. On MyCanon 5D 90mm 1:1. 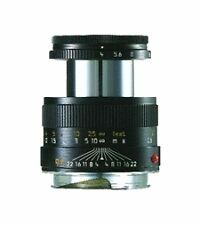 This is an autofocus lens with manual switches there is alimit switch to speed up macro work. Lens is clear free of dust and fungus. Lens is in superb condition, i would say 9/10, does have filter on it, well cared for lens. Tamron SP 272E 90mm f/2.8 Di AF SP Lens Nikon Fit - Rarely Used. In Excellent Condition. With original pouch. I very good working condition. Tamron SP 90mm f/2.5 Macro with nikon adaptors, 2x converter and extension tube. Condition is good. The lens optics are clean with no scratches or fungus. Both optics have minor dust inside. 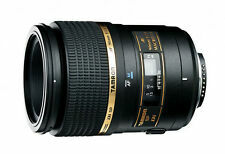 4.5 out of 5 stars - Tamron SP 90mm f/2.5 Macro with nikon adaptors, 2x converter and extension tube. 8 product ratings8 product ratings - Tamron SP 90mm f/2.5 Macro with nikon adaptors, 2x converter and extension tube. The lens is in fully working order and with clean glass. It is fully boxed and in perfect condition as shown in the pictures. Hopefully its next owner will get a lot more use out of it! The lens is in excellent clean condition. The optics are clean and clear, dust and fungus free, the aperture blades are nice and snappy. The body is excellent showing very little signs of use. This lens will give 1:1 life size images without the need of further extension tubes. A very nice and solid lens - Schneider Super Angulon 90mm wide angle lens. Shutter speeds all sound and look good including the slower ones. This was a Linhof-select lens and shutter. Glass is very clean. Blades are nice and snappy and oil free, the glass is very clear for it's age and has no fungus. This lens is good condition, it would be in great condition if it didn't have a ding on the body, see picture. 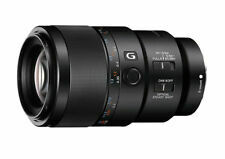 Sony SEL 90 mm F/2.8 FE G OSS lens, in lovely condition. Comes boxed as seen in the photos. This lens has seen amateur use only and as I don’t really use it, it has to go! No scratches or marks so a great lens. Any questions please ask. Overseas bidders welcome. See my other Sony items. Optics clear no scratches of fungus. 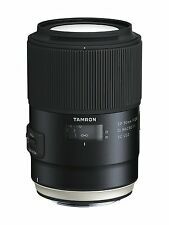 Tamron SP 272E 90-90mm f/2.8 Di AF SP Lens. Condition is Used. Dispatched with Royal Mail 1st Class. Tamron SP 90mm f/2.5 Manual Marco Lens (52BB). This should be the last manual version of the Tamron 90/2.5 series before the automatic era. Specialising in photographic lens filters. Includes front lens cap. Smooth focus and snappy aperture. You are bidding on a Leica R 90mm f/2.0 Summicron lens, serial number 2949085, with both end caps. The optics are clean and clear with no scratches, haze or fungus. There is some wear to the paint markings on the barrel (see photos), but the lens is otherwise in good working condition. Relisting due to a time waster. Free from dust fungus etc, optics excellent . No fungus, haze or marks, shutter and blades fine but 'T' not fully working, opens fine but does not close until you turn the speed dial back, 'B' is fine. With flange, mount aprox 32mm. Any problems will always be dealt with promptly. Tidy Elmarit M 90mm portrait lens, complete bundle with items shown, lens cap, LTM rear silver cap, Leica M mount converter, with rear silver cap for that as well, and also an excellent Fodor 34mm UV filter, silver, which matches the lens. Leica Leitz R 90mm F 2.8. In used condition. With both front and rear caps. Optics are visibly clean inside and out. Please see example images shot with this lens..
Rodenstock Caltar II-N 90mm f/6.8 MC Lens Copal 0 Lens MINT! Optics has no cleaning marks, scratches and are clean from fog, mold and fungus. Diaphragm works perfect and smooth. See photos for detailed information. t will autofocus with: Df-D1-D1x-D1H-D2-D2x-D2xs-D3-D50-D70-D70s-D80-D90-D7000-D7100-D7200-D100-D200-D300-D300s-D500-D600-D610-D700-D750-D800-D810-D850 & Fuji S1, S2, S3,S5 It will not autofocus with : D40, D40x , D60,D3000,D3100,D3200,D3300,D3400, D5000,D5100, D5200,D5300,D5500,D5600. Canon Vivitar 90mm Lense. Condition is Used. Collection in person only. Pictures and Info Coming Shortly. Leitz Leica ELMAR 90mm F4 Leica. The focusing ring moves smoothly, not too loose and not too tight. Serial No. 1713 793. Leica 90mm f4 Elmar lens. E39 front ring. Ready to fit to your Leica M body (or Mirrorless body via adaptor) and enjoy. Images really nicely on my focus finder and is most usable as it is. We are located 10 minutes from Junction 37 of the M62 in East Yorkshire. Condition is Used. Sad to let this go. Optics are clear and I used it on a Sinar body. Great lens. I am selling these two brand new (sealed box as shown in the pictures) Tamron AF 90 mm lenses. The lense mount with Canon EF, Nikon F (FX), Pentax KAF, Sony/Minolta Alpha cameras. They come with one year warranty (Japan only). The price is £350 for each! Lens is in as new condition, clean optics and smooth focus. Tamron SP 90mm f/2.8 Di AF SP Nikon Fit Macro Lens. The lens is in excellent overall condition showing minimal signs of use (see pictures). It's an amazing macro lens and produces great images. - Tamron 90mm F/2.8 Nikon Fit lens. NO. 1726239 (DATING FROM 1960). LENS & BARREL MATCHING SERIAL NUMBERS. Overall a great fully functional lens at a good price. LIECA M MOUNT. The aperture ring feels a little loose however is fully functional. Works with both RB67 and RZ67 cameras, as this is a mechanical lens with the RZ67 you set the shutter speed from the lens and not the body. 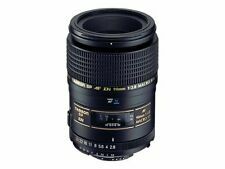 Tamron 90mm f2.8 SP AF Di 1:1 Macro lens for Sony / Minolta Alpha A mount. Macro 1:1 - Also Great for portraits. Sharp as a tack ! Tie up protective pouch. Hardly used, as new condition. The lens is in very good condition as can be seen in the photos. Aperture opens and closes as expected, focus ring is very smooth. I would say it is one of the sharpest lens I have used. 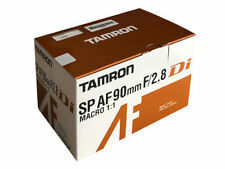 Tamron SP AF 90mm f/2.8 DI macro for CANON with front cap. The lens is in mint condition, I probably used it 3 or 4 times since I bought it. It comes without box since I can't find it anymore, but I'll ensure the product will be protected when delivered. Fuji XF 90mm F2 R LM WR Fujinon Lens in EXCELLENT condition. Original box.